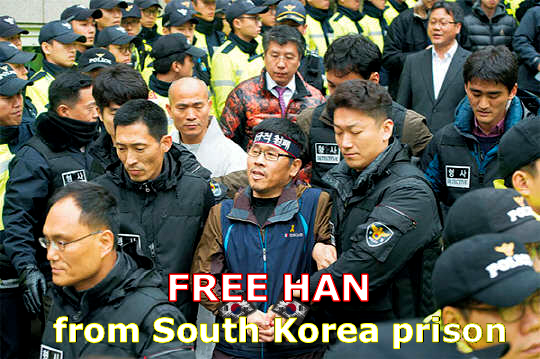 South Korea continues to imprison Han Sang-gyun (한상균), the Korean Confederation of Trade Unions KCTU President. He was arrested for leading demonstrations against the corrupt Park Geun-hye administration. Although a new government is now in power, he's still held behind bars as a political prisoner. Amnesty International (link) as well as the global Public Services International (link) trade union federation, and many others monitoring global injustice demand Korea release Han Sang-gyun. President Moon Jae-in, a positive force in many ways, could pardon Han Sang-gyun immediately. Non-violent civil disobedience should be cherished in South Korea... instead, we see resurgence of controls & democracy suppressed. Corruption & chauvinism in South Korea must be stopped.